A three section hinged screen for your fireplace. 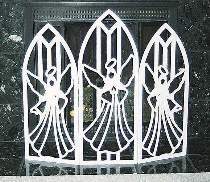 Popular angel theme is suitable for holiday or year round display. Make from 1/2" plywood. Measures 33"H x 37"W. Plans for all three sections draw FULL SIZE.